the end of 2017 is upon us, and that means several types of lists will be flooding the internet: the best moments of the year, the worst, what went out of style, and lists forecasting what'll be "in" for the next year. 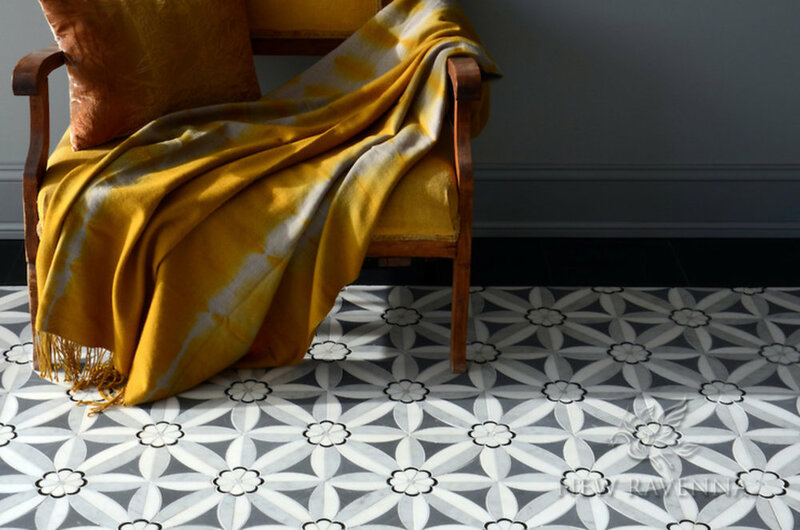 so here we are, with a list forecasting what's currently hot and only going to get hotter in 2018 in the world of tile design. black and white - the most classic combo. why would grout be any exception? also please note the hex and matte black fixture - v haute. a subdued golden grout tone matching the fixtures #slays and elevates the what would traditionally be your average subway/herringbone configuration. yis. yip. yaaaaas. that is glitter grout, it is a real thing. it's actually a grout with minuscule pieces of ground glass. it's fully sealed, smooth (you're not gonna cut yourself running your fingers over it), and it's just the statement any and every home needs. gloss + black + black + gold and life is but a dream. it's well-known that a quick and relatively inexpensive way to increase your home's resale value is to update your bathrooms. often, this includes a tub update, a new faucet, sink, maybe a vanity, and probably some tile. to add new tile for the sake of adding new tile, 3 x 6 porcelain subway tile is a cost-effective and safe option. consider a reconfiguration of the traditional offset that'll add a punch of design but won't overwhelm new buyers. everyone loves a good herringbone. a simple, super on-trend and unique touch to elevate even the cheapest tile to extraordinary. 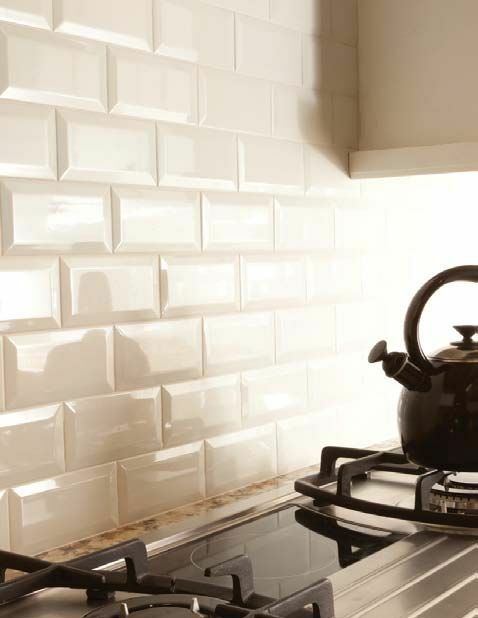 if you're set on using a subway tile, consider one with a beveled edge; it'll provide more dimension and light play than a flat subway would, giving the appearance of a much more high-end and thoughtful design, without the high-end price tag. who says subway tile has to be a white porcelain? 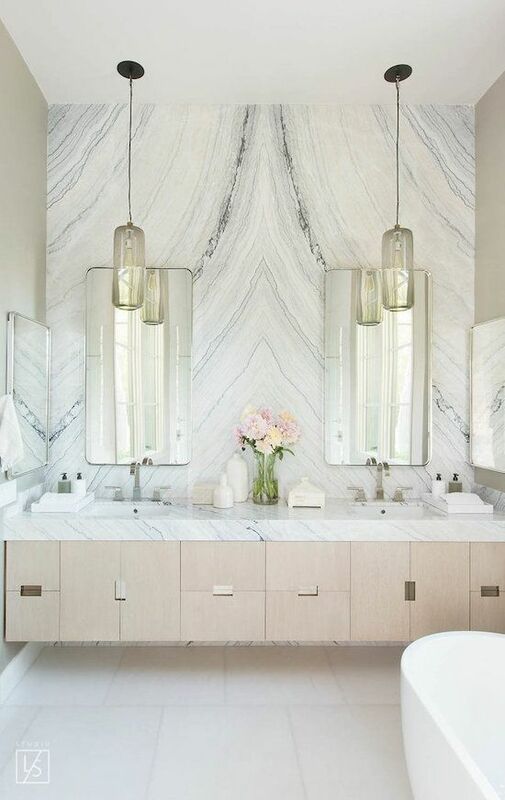 add some depth and dimension with a mirrored or glossy tile. 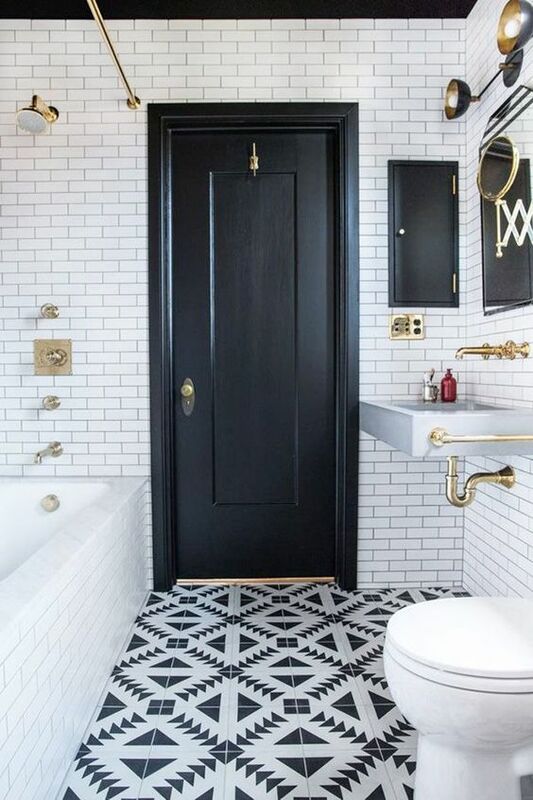 this ain't yo mama's subway tile, that's for sure. I won't stray too off topic here with the brushed bronze fixtures (heart eye emoji), but the standard 3 x 6 configuration makes a perfect square when doubled together; huh. talk about an entirely fresh take on a subway. no, not "stencil your own" budget flooring. I'M not sure what the key ingredient to this is - the mosaic design, the colorway, the gold, the marble? this is one of those rare "forever" floors. make a bold statement but stay versatile in design by maintaining a cooler, neutral colorway. 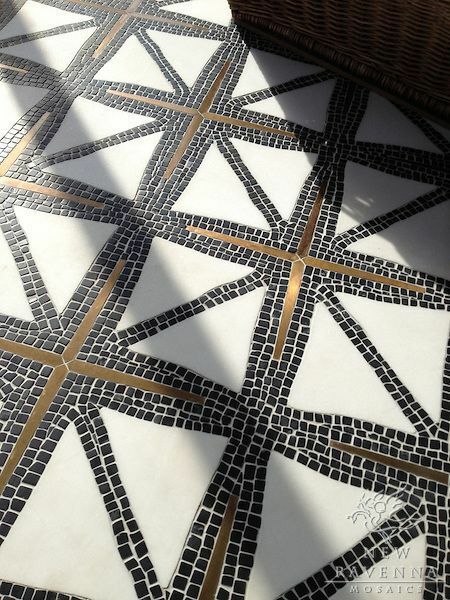 a mosaic floor is an investment, so be sure you're not too trendy. with a neutral colorway and graphic but classic pattern as well as marble matterials, this is another floor that will live long, long after the "paint your own statement floor" trend passes. if you're adding a vibrant pattern to your space, be sure to keep the rest of your design clean and easy on the eye. coordinating fixture and wood finishes along with clean white walls, a white toilet and tub keeps this space perfectly balanced. terra cotta has been around forever, but it's starting to be used in conjunction with more contemporary fixtures. characteristically, it is ~amazing~ in that it is incredibly durable, relatively easy to make, and cost effective. statement terra cotta tiles are fabulous for dressing up fireplaces. they can withstand the heat whilst providing a comforting vibe. terrazzo is maybe the last element to be revived as part of the mid-century modern era. traditionally a non-residential material, terrazzo tiles are getting hotter and hotter by the minute and I'm SO happy about it! unlike a quartz, granite, or even marble, terrazzo is unique in that you can see every single aggregate added, creating such a shiny and special look. though it's still a little pricey, it's comparable to a carrara price point and looks just as special (if not more) unique. hey, you can even mix the two. again, large format! 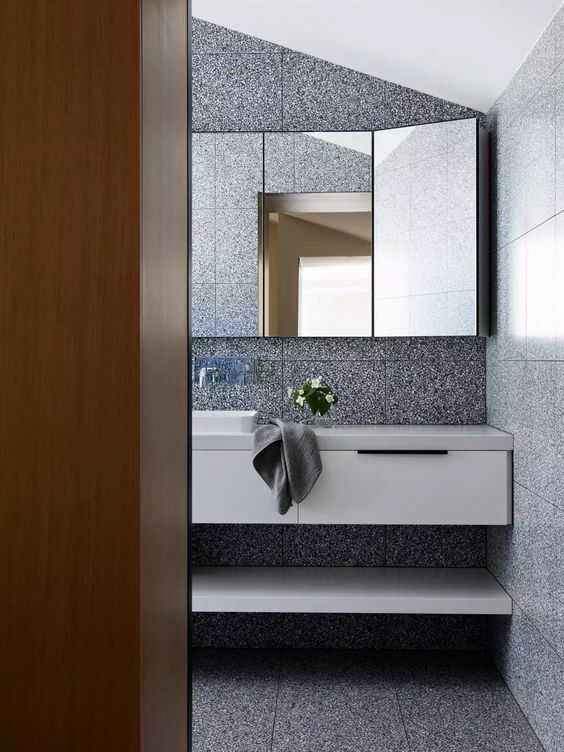 a characteristic of terrazzo is the relative even distribution of the aggregate between tile to tile, so tiling rooms such as this appear as seamless as possible. terrazzo is fantastic in the ability to be poured in any shape or format, and the metal dividers are stunning. it can be created in virtually any color, polished or honed, and can include any aggregate your heart could ever desire. when originally created in the 1920's, terrazzo was poured in huge formats and was extremely prone to cracking; the solution to this was the metal dividers you often see inlaid in floors; smaller sections were able to be poured and make the material less prone to cracking. with modern terrazzo materials, cracking is much less of an issue, but thank god for the metal dividers, because for it we have designs like these. quartz is in, and quartz is in in a big way. 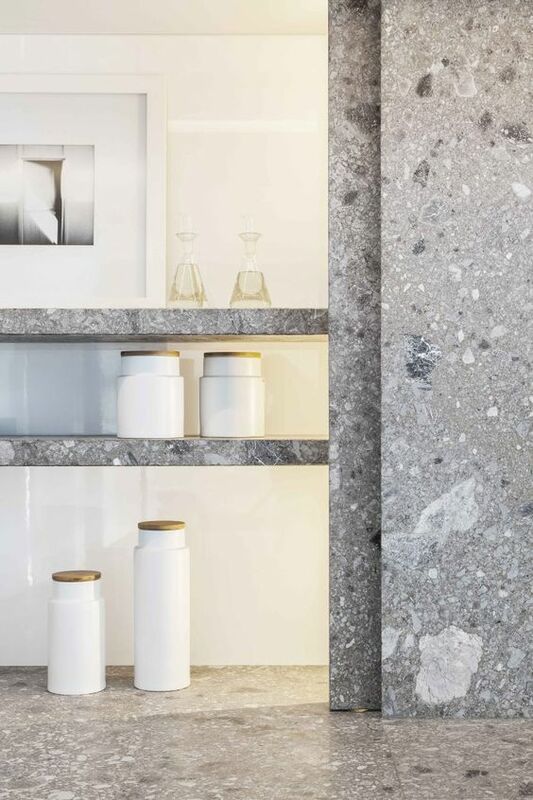 a gorgeous way to carry a countertop through, or just add a truly one-of-a-kind element to your home is to do a quartz (or granite or natural stone, if you're more into that) is to add a slab of your counteras your backsplash. you can seam it straight down the middle for incredible symmetry, or slice and dice however your space dictates. I don't even want to think about the labor and logistical process that went into this, so I'll just sit here reveling in the beauty. that's what they call "good design," kids. a slab backsplash doesn't have to be huge, nor does it have to necessarily have to break the bank. most standard slab sizes comes in 30 x 72" configurations, which is generally enough to cover a typical sized backsplash. if needed, an adequately placed seam will be okay, and if ordered together, multiple slabs from the same batch will go together just fine. mix a statement slab with a large format floor for a contemporary look. we've got a year to see where these trends take us! what are your thoughts on current tile applications?